We came here from Madison Valley with our two children. We lived in a little house with 1 room, and that was a bit small by now since little Amy is born. We fitted in very quickly. The first landfill started working 2 weeks ago. The director of the company is the 30-year-old Richard Haledon. He’s dad had a business in Fillmore. Richard moved here with his dad, and his brother when he was 15. He worked as a postman for 7 years. Then his dad opened a hardware store, he worked there for 6 years. His dad died in carbon monoxide poisoning, so Richard closed the Hardware store for safety reasons. And now he owns 2 horse carriages to collect trash. 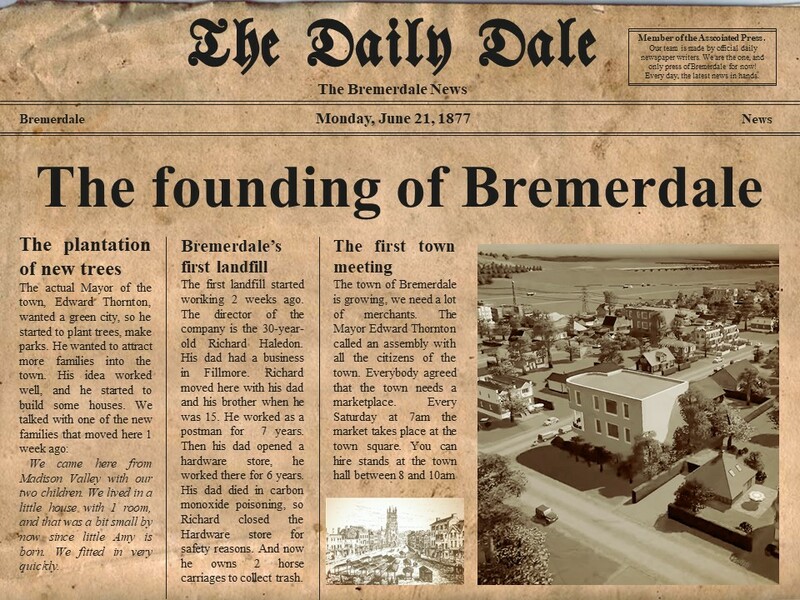 The town of Bremerdale is growing, we need a lot of merchants. The Mayor Edward Thornton called an assembly with all the citizens of the town. Everybody agreed that the town needs a marketplace. Every Saturday at 7am the market take place at the town square. You can hire stands at the town hall between 8 and 10am.